If one looks at the few reputable texts on South African Coins like Engelbrecht,Becklake and Rosenthal, each book deals with the coinage used in the era before the ZAR period and that starts with amongst other, the VOC coins in the 1700s.These authors were therefore very aware that a comprehensive book demanded the filling in of those 222 years with the coinage then circulated.Unfortunately Brian Hern, whose catalogue the market uses does not mention these coins or their values excepting the circulated Griqua coins , probably because the area is too ill defined and prices hard to find. The VOC was the world's first megacorporation and made its millions over two centuries (1602 to about 1800) around the lucrative spice trade which needed the Cape Sea route as its strategic key for refreshment as Scurvy (Vitamin C deficiency) was a major cause of death. Coins were used in this trade and the VOC was only allowed to have its Monogram put on the silver coins minted from 1786 to 1791 although the Duits and Stuivers were allowed to have the emblem from 1755 (Silver) and 1726 (Copper) respectively.The permission to have its own coinage speaks volumes about the power of that company that was itself a government within the government of Netherlands with its own fleet of warships and armed soldiers. The top coin of the VOC series is the hardest to find and it is the 3 Gulden. It is larger than a ZAR Crown (40mm in diameter) and was struck on an uneven planchet weighing in at 31.8200 gm (0.9200 Silver). It followed the Silver Ducatoon. VOC silver coinage was made for the Cape and the East and although the smaller silver Guldens and Silver Duits are obtainable, the larger 3 Gulden is very seldom found thanks to extensive melting in a Silver hungry East. 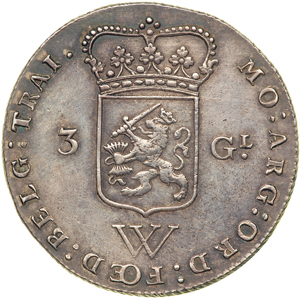 A picture of this coin is shown on page 16 (8) of Engelbrecht and page 10 of Rosenthal (Van Boesmangeld tot Barclays) along with the other silver members of the VOC issue. As with the more common Dutch 3 Gulden for use within Holland (pics shown of that one - one of only two coins graded ever), these VOC 3 Gulden Coins were minted in the various provincial mints ie Utrecht (Traiectum) Zeeland, West Friesland etc. 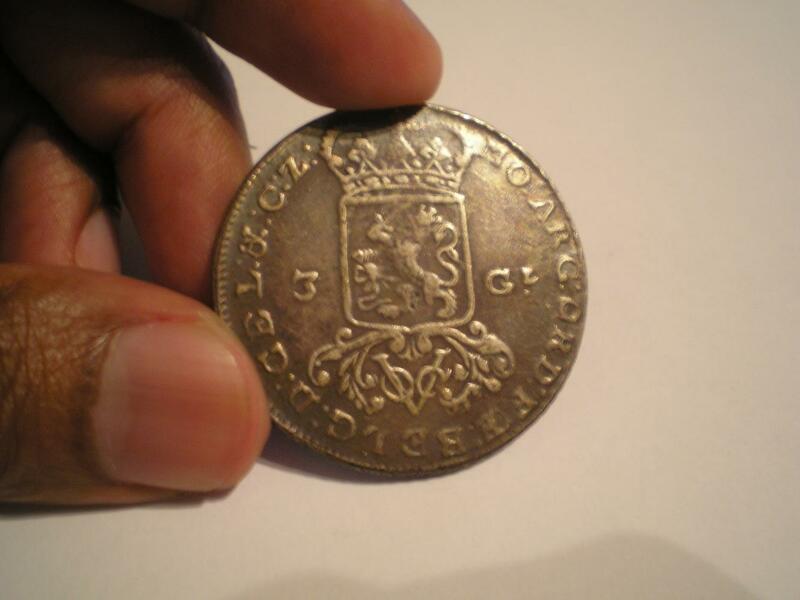 I enclose a Picture of the first VOC 3 Gulden obtained and call on all collectors to watch out for this coin. It is extremely hard to come by and will fetch a premium when a more comprehensive catalogue on SA coins addresses more fully the 222 years of coins issued prior to 1874 with internet sources on prices and denominations.NGC has graded one or two of these VOC 3 Guldens. I would welcome more research into this area and further contributions. That is unquestionably a highly underrated coin. It certainly did circulate in a limited fashion across the Dutch East Indies (including among the white settlers at Cape Town) in the late 1700s. 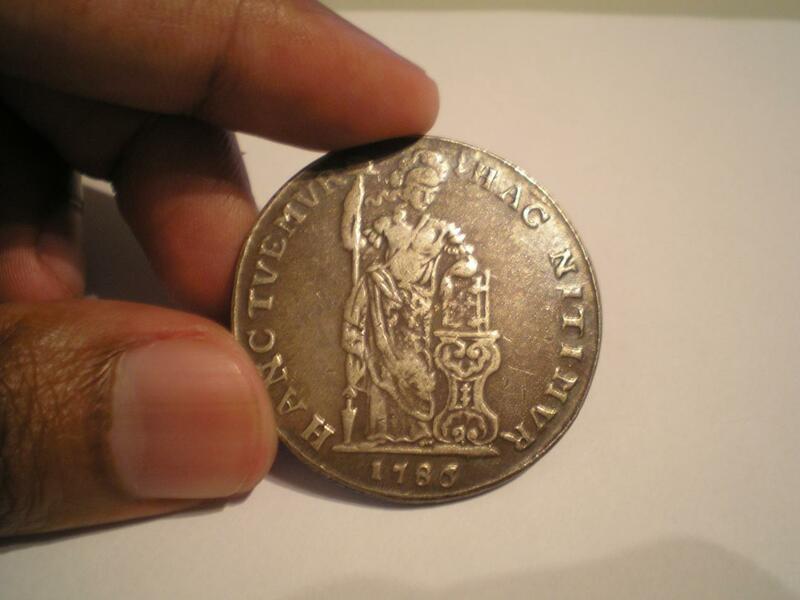 I am fortunate to own many VOC coins including a silver one guilder. I have no doubt that the three guilder will attract a lot of interest. Thanks for a wonderfull bit of info. Now I know which books to obtain. The Netherlands West Indies comprised the Caribean Islands which came under Dutch VOC control in the early 1700s. How much would a 1786 3 Gulden fetch now? I have one of these coins, not too sure exactly which variety though, and will put it up for auction soon. Could you tell me what sort of price I should put it up for? I dont want to let it go if it's worth more than I think. I will put up images of the coin tomorrow evening... too tired now to do anything. Very nice coin and as I have found in the above there are two of this type graded somewhere in the world. Yours is a VF grade I would say and was minted in Gelderland Province Netherlands - the abbreviation on the reverse stands for the following completed text in Latin; D(ucatus) GEL(riae) &C(omitatus) Z(utphaniae) van het hertogdom Gelre en het graafschap Zutphen (Dutch) . This information comes from an extract I made of the late Dr Frank Mitchell's Book that is now in possession of an old wreck diving friend of mine "Officiele Muntencatalogus Netherlands Indie 1594 - 1949" Zonnebloem Amsterdam 1977. Its value will depend on the buyers- I would think the the section on Ancient and Shipwreck Coins would be the place to put such a coin - please let me know by PM when you do. Amazing what lies around undiscovered until there is some historical information disseminated.